Yesterday my wife and I went to the Benaki Museum’s excellent exhibit, “Smyrna: The Destruction of a Cosmopolitan City, 1900-1922.” It consists of a photographic exhibit and an accompanying documentary film. It’s directed and curated by Maria Iliou, who was aided by Alexander Kitroeff, a professor of history at Haverford College and a specialist in modern Greek history. The entire affair is very popular. Yesterday’s viewings were sold out and we had to go to the Benaki Piraios St. Annex to see the documentary. I suppose this shouldn’t be a surprise—the idea of Smyrna is still a potent force in modern Greece. Descendants of the refugees are certainly very well aware of where they came from and tend to take pride in the fact that they are mikrasiates. 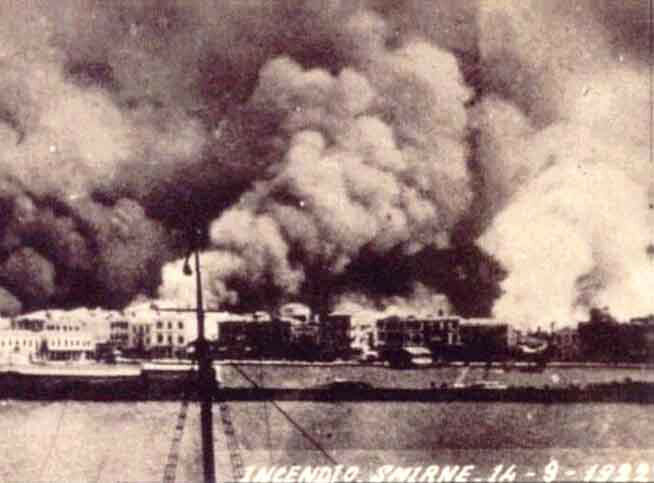 Smyrna (as the above title suggests) was one of these late nineteenth-early twentieth century cosmopolitan cities of the Ottoman eastern Mediterranean. Others included Alexandria, Constantinople, Beirut, and so on. Smyrna’s largest population was Greek, some 120,000 by 1920, but it also included ca. 80,000 Muslims, 20,000 Armenians and a sizeable Sephardic Jewish population. It was also home to a number of very wealthy foreign families, the so-called Levantines, who hailed from Britain, France, and Italy predominantly (the Whittalls, Girauds, e.g.). By 1900 most of the members of these families had lived their entire lives within the Ottoman empire, based in Smyrna and esp. its suburbs, such as Bournabat and Kordelio. They amassed their fortunes trading the (predominantly) agricultural goods cultivated in Smyrna’s hinterland, most of which were meant for international markets. The Capitulations allowed them to trade tax free within the Ottoman empire, and also to live outside its laws (for the most part). The photo exhibit is culled from numerous archives: the War Museum in Athens, the Library of Congress, Princeton University Libraries, National Geographic, the Pierre de Gigord Collection, Levantine Heritage Collection, the Haris Yakoumis Collection, and many more that are too numerous to list here. The selection was done carefully, and the photos on display bring the city to life nicely. Unfortunately one is not allowed to takes photos of the photos, so I’ll describe some of them here, and try to give an overall sense of it. 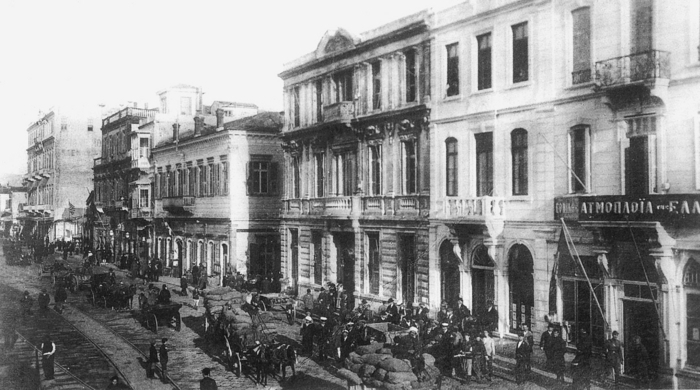 There are images of the city’s major power brokers and other important people: Rahmi Bey, the Ottoman governor; George Horton, the US consul; Mustafa Kemal (later Ataturk), the city’s eventual conqueror; Aristidis Stergiadis, the governor of the city from 1919 – 1922, appointed by Venizelos (also pictured, of course). But what caught my attention the most were the photos of the daily life of the city: the quayside, bustling with people, cafes, hotels, warehouses, ships, and camels laden with figs; the Rue Franque, the main commercial thoroughfare in the city, a narrow street packed with shops selling local and international goods; the elegant mansions in the Bella Vista neighborhood, where many Greeks lived, along the waterfront, beautiful examples of late Ottoman architecture blended with neoclassical forms; Ayia Foteini church, the Greek Orthodox cathedral in the city, with its tall bell tower; and English troops, absurdly obvious in their shorts and calf-high socks. Some esp. were outstanding for their vivid details: one photo shows a wealthy Greek couple dressed in expensive, western-style clothing next to a Turkish vinegar merchant, without shoes, who’s carrying an amphora of his product on his shoulder; in another, a disapproving father looks down upon a doctor examining his son; there is a picture of the Jewish quarter, which contains the raw, sweaty, dirty faces of commoners in the foreground, eyes wide open to the camera; and, finally, a memorable picture of refugee tents situated next to the Hephaisteion in Athens. The film uses many of these images, but also much more—rare footage that, it seems, you’d be hard pressed to find elsewhere. The entire film is set to music written by Nikos Platyrachos, and it runs the gamut of these 22 years. It begins with “Cosmopolitan Smyrna: 1900-1912,” then moves to “On Borrowed Time: 1912-1922,” then the city’s destruction in 1922. It features interviews with Giles Milton, A. Kitroeff, and several individuals with family connections to the city (Armenian, Greek, and Turkish). The movie is very balanced in its approach, but it doesn’t shy away from gruesome scenes or avoid discussing the atrocities which were committed there. Photos of corpses are shown on the quay after the fire, while vivid descriptions are given of the screams that came from the city on the night of the 13th, as the city burned. They were loud, unavoidable, and unrelenting. 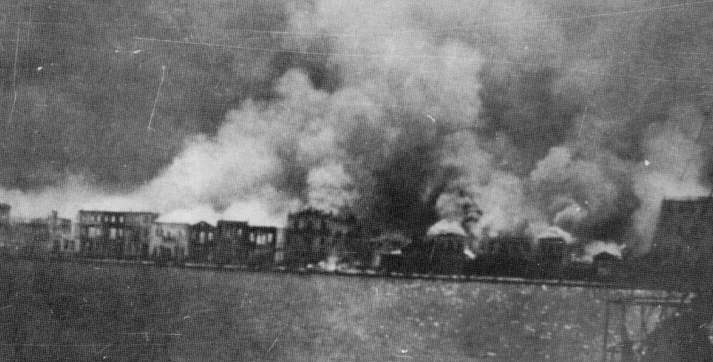 Over the next few days, the harbor became filled with the corpses of those attempting to flee the flames. People jumped into the water because they had nowhere else to go. The fires had penned them in, and the Turkish army wasn’t letting anyone leave. Even the allied ships, which were moored in the harbor offered no help. 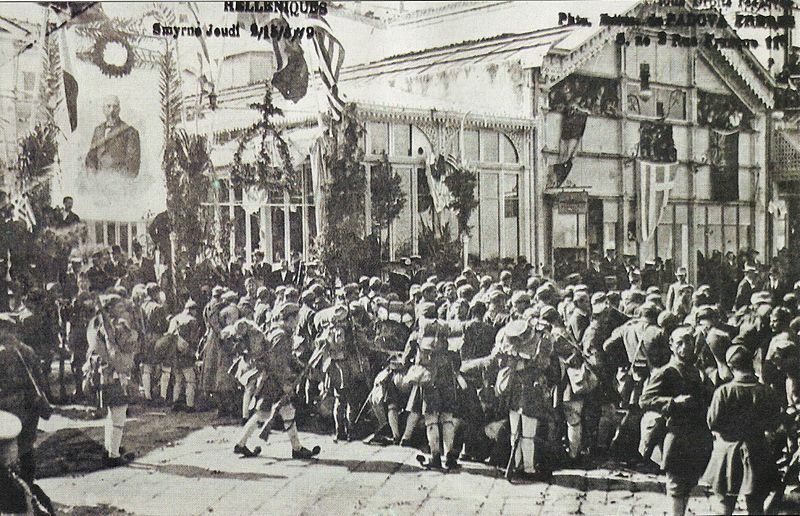 They were under strict orders not to intervene on the Greek or Armenian side, since it was clear that the Turkish nationalists had won the war. Eventually, however, an American Methodist minister, Asa Jennings, convinced the Greek navy in Lesvos that it had to send transport ships to evacuate the remaining survivors, which it eventually did (with the consent of the Turks). On the whole, the film succeeds in its goals. It presents the cosmopolitan nature of the city vividly, while also reminding the viewer that it met a tragic end, one in which both sides were culpable: the Turkish conquest of the city was certainly a bloody affair, but so, too, was the Greek retreat through Asia Minor, which employed a scorched earth policy. The interviews, too, demonstrate that Smyrna as an idea certainly lives on today among the city’s descendants. It’s my hope that the organizers will publish this fine collection in the future. The exhibition and documentary run for another week, until March 18. Hours for the movie may be found here. The theater at the main Benaki building is small and fits no more than 50 people, so be prepared to go to the Piraeus Street Annex, where ca. 360 viewers can be accommodated. I’m told that Maria Iliou is working on a sequel, on the subsequent population exchange. For Smyrna, see M. Llewellyn Smith, Ionian Vision: Greece in Asia Minor, 1919-1922, Giles Milton, Paradise Lost: Smyrna 1922; and Jack Davis, “A Foreign Archaeological School and the Politics of Archaeological Practice: Anatolia, 1922,” Journal of Mediterranean Archaeology 16.2 2003, 145-72, for the brief American excavations at Colophon in 1922 sponsored by the American School of Classical Studies at Athens. 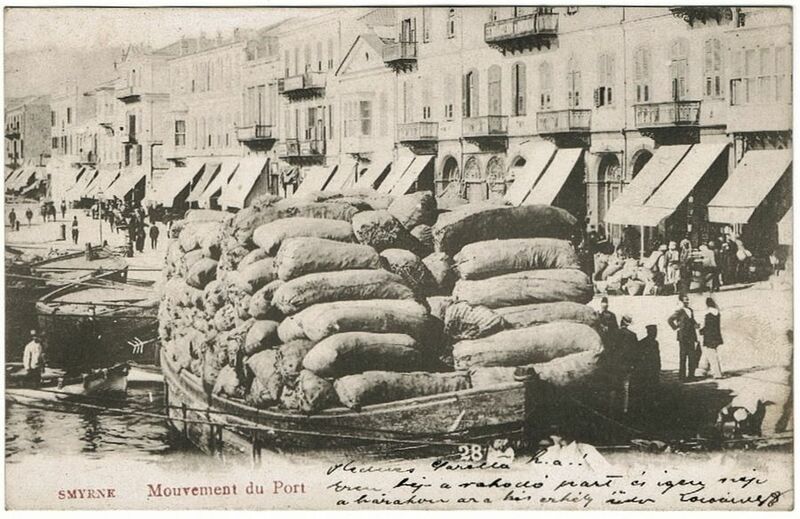 This entry was posted in Benaki Museum, Modern Greece, Ottoman Greece, Smyrna. Bookmark the permalink.